The Beautifull Lorry Cart name in Lebong Tandai is Molek - Hear the word "Molek" we are of shadow at pretty and beautiful girl figure. 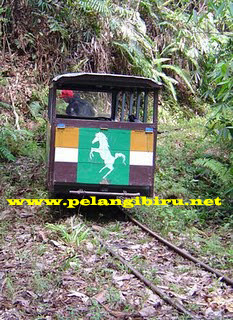 other but the things of with surounding citizen mine "Lebong Tandai " interpret Molek As minicart ommission of colonization epoch which have been modified in such a manner so that look like a city transport which is used as by the transportation medium land the single (besides air and river path) citizen Lebong tandai for exit to go to capital of district Napal Putih. In general Molek can 6-8 passenger people with impeller use the diesel engine which have didesain in such a manner to turn around the attributed to lorry wheel enchain king sizedly. Molek have 4 iron wheel of distance each his wheel tinder is more or less 1,25 Meter. But have the body length of more or less 5 Meter. Can be conceived, needed by the good balance to be lorry cart not inversed. A Molek usually in pilot by a the is driver of his function arrange speed of diesel engine, and don't arrange to turn. Driver function is also much the same to be like a the train engine-driver arrange fluency the way Molek. Molek passed path (Napalputih district capital Ketahun - Lebong tandai) apart the more or less 33 km with time go through the mean during more or less 4-5 hour With the field condition passed by in the form of plantation of resident, forest, bevel, river and once in a while underground tunnel. You have to prepare extra bravery more to use this transportation because during our journey will go through journey in between by the hill boundary, left side of high bevel and right side is the river and creavasse race along. In general Molek departure route divided 2 schedule to avoid collision of adversative direction, morning route ( 08.00 AM-01.00 PM) is route go up from district napal Putih go to district Lebong Tandai is while route noon (01.00 PM-06.00PM) is route alight from district Lebong Tandai go to district Napal Putih.